In one way or another Newt Gingrich has been leading a revolution for most of his life. 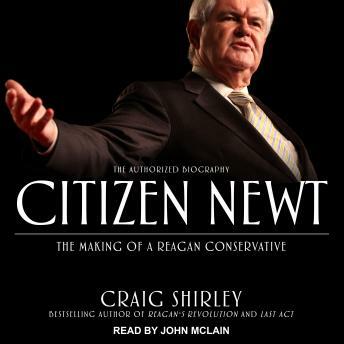 Citizen Newt is the definitive account of that struggle. Writing with the full cooperation of Speaker Gingrich and the players around him, New York Times bestselling author Craig Shirley captures the events, ideas, failures, and successes of Newton Leroy Gingrich-one of the most complex, influential, and durable political figures of our time. Returning to Gingrich's childhood in Pennsylvania and his formative years as a young history professor, Citizen Newt moves through Gingrich's first forays into politics and takes listeners behind the scenes of the congressman's crucial role in the Reagan Revolution, his battles with George H. W. Bush and Bill Clinton, and his masterly orchestration of 1994's 'Gingrich Revolution' and the Contract with America, which catapulted him to national prominence and forever changed congressional and national politics. Drawing upon untold stories from Gingrich and those who know him best-political allies and opponents, Washington insiders and political iconoclasts, Capitol Hill staffers and colleagues-Shirley has crafted a fascinating, humorous, humanizing, and insightful account of a true American original.